PGConf.EU 2018 - the biggest one yet! Posted on Nov 19, 2018 at 21:01. Tags: pgconfeu, postgresql, conferences, community, pgeu. It's now almost a month since PGConf.EU 2018 in Lisbon. PGConf.EU 2018 was the biggest PGConf.EU ever, and as far as I know the biggest PostgreSQL community conference in the world! So it's time to share some of the statistics and feedback. 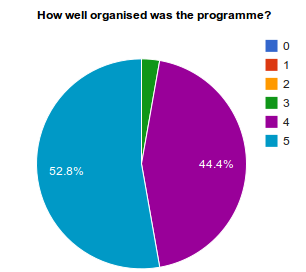 Of these 451 registrations, 47 were sponsor tickets, some of who were used by sponsors, and some were given away to their customers and partners. Another 4 sponsor tickets went unused. This year we had more cancellations than we've usually had, but thanks to having a waitlist on the conference we managed to re-fill all those spaces before the event started. Posted on Aug 22, 2018 at 14:39. Tags: conferences, fosdem, postgresql, pgconfeu, stockholm, prague, tokyo, san francisco, postgresopen, pgeu. Summer vacation times are over. Well, for some of us at least, clearly some are still lucky enough to be off, which is showing itself a bit (see below). But as both conference organisation and participation throughout the rest of the year is starting to be clear, I figure it's time to share some updates around different ones. First of all - if you haven't already, don't forget to register for Postgres Open SV in San Francisco in two weeks time! Registration for the main US West Coast/California PostgreSQL community conference will close soon, so don't miss your chance. I'm looking forward to meeting many old and new community members there. Next up after Postgres Open will be pgconf.eu, the main European PostgreSQL community conference of 2018. The planning for this years conference is at full speed, but unfortunately we are slightly behind. In particular, we were supposed to be notifying all speakers today if they were accepted or not, and unfortunately our program committee are a bit behind schedule on this one. We had over 200 submissions this year which makes their work even bigger than usual. But speakers will be receiving their notification over the upcoming couple of days. Hopefully once all speakers have been able to confirm their attendance, we will also have a schedule out soon. Until then, you can always look at the list of accepted talks so far. This list is dynamically updated as speakers get approved and confirm their talks. We have already sold approximately half of the tickets that we have available this year, so if you want to be sure to get your spot, we strongly recommend that you register as soon as you can! And if you want to attend the training sessions, you should hurry even more as some are almost sold out! Work on the program committee of PGConf.ASIA has also been going on over the late summer, and is mostly done! The schedule is not quite ready yet, but expected out shortly. You can look forward to a very interesting lineup of speakers, so if you are in the Asian region, I strongly recommend keeping an eye out for when the registration opens, and join us in Tokyo! As has been announced, PostgreSQL Europe will once again run a FOSDEM PGDay next to the big FOSDEM conference in Brussels in February next year. We hope to also run our regular booth and developer room during FOSDEM, but those are not confirmed yet (more info to come). The Friday event, however, is fully confirmed. Of course not open for registration yet, but we'll get there. Nordic PGDay has been confirmed for March 19th next year. The format will be similar to previous years, and we will soon announce the location. For now, mark your calendars to make sure you don't double book! And rest assured, the conference will take place somewhere in the Nordics! Then there are a number of smaller events of course. Next week, I will speak at the Prague PostgreSQL Meetup. We should be kicking off the Stockholm usergroup. PDXPUG runs a PGDay in Portland in September (which I unfortunately won't be able to attend). In general, it seems like usergroups are starting to get going again after the summer break, so check with your local group(s) what's happening! Posted on Feb 7, 2018 at 17:49. Tags: conferences, pgeu, pgconfeu, postgresql. With the upcoming elections in PostgreSQL Europe, I'm excited to see that we have more candidates than ever before. 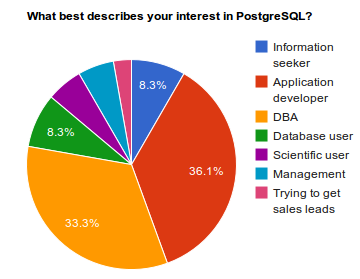 But during the FOSDEM conference we just finished in Brussels, that also lead to a fairly large number of people who asked me the simple question "what does it actually mean to be on the board of PostgreSQL Europe". So I think it's time to summarize that for both those standing for election, and for the members of the organisation in general. For a TL; DR; version, being on the board basically means a lot of administrative work :) But read on for some details. Posted on Nov 14, 2017 at 21:56. Tags: postgresql, pgconfeu, conferences, pgeu. For anybody following this blog, you'll know I do this every year. 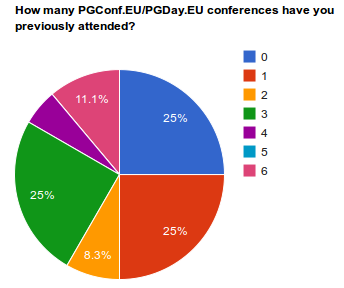 PGConf.EU completed several weeks ago, and we have now collected the statistics, and I'd like to share some numbers. Our total number of attendees registered was 437. This includes all regular attendees, speakers, training attendees, sponsor tickets and exhibitor only tickets. Of these 437 people, 12 never showed up. This was a mix of a couple of sponsor tickets and regular attendees, and 3 training attendees. This means we had 425 people actually present. We don't take attendance each day. Right after the keynote on the first day there were just over 20 people who had not yet shown up, and by the end of the conference the total that number was down to 12. There were definitely fewer than 400 people who remained on a late Friday afternoon for the closing sessions, but at lunchtime the crowd was approximately the same size. On top of the 437 actual attendees, we also had 5 further sponsor tickets that were never claimed. And we had another 59 people still on the waitlist, since we were unfortunately up against venue limits and we not able to sell all the requested tickets. Posted on Nov 16, 2014 at 13:56. Tags: conferences, pgconfeu, pgeu, postgresql, talk. It's that time of the year again - we've wrapped PGConf.EU 2014, and I've just closed the feedback system, so it's time to take a look at what's been said. We're keeping fairly consistent numbers with previous years, which is something we are definitely happy with. We did have a slight drop in "overall view", since this year we had 8% ranking us as 3, a worse score than we saw last year, and we had a couple of fewer people voting 5. And a slight shift from 5 to 4 on the programme. The numbers are still good of course, but since we had a tiny drop last year as well, we need to step our game back up for next year! This year we had a slightly bigger spread of how users identify themselves, seeing most categories chip away a little on DBAs and Developers, but they are still definitely the dominating categories. We also have a lot of returning developers - it's cool to see so many people who have been to every one of our events so far, combined with a full 25% being first-time attendees! Posted on Mar 30, 2014 at 15:54. Tags: conferences, nordic, pgday, pgeu, postgresql, stockholm, sweden. 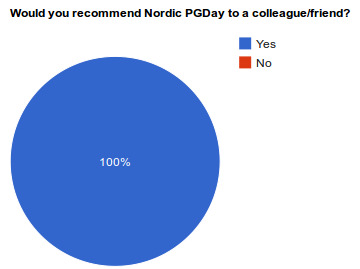 Nordic PGDay 2014 was just over a week ago in Stockholm, Sweden, and was definitely a success. A lot more people than we initially expected had the event sell out completely a couple of weeks before it happened. A week later we've now collected the feedback forms that people filled out (a big thanks to the 25-30 people who did fill them out - a 30% "hit rate" on feedback forms gives us a pretty good input). In particular, that every person who filled out our feedback would recommend the event to friends or colleagues is definitely a flattering grade! 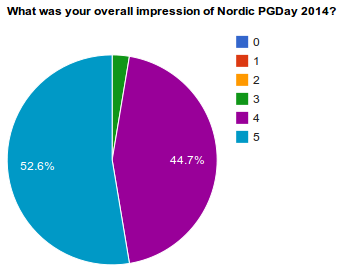 Nordic PGDay 2014 - come join us up north! Posted on Dec 28, 2013 at 13:55. Tags: conferences, pgday, postgresql, stockholm, sweden. It's been discussed for several years, so I'm very happy to finally be able to announce that next year, there will be a Nordic PGDay, in Stockholm, Sweden, on March 20th. It will follow a pattern that is common to those of you that have already visited other PostgreSQL event - a combination of great talks from PostgreSQL insiders, and a hallway track to meet and talk with other PostgreSQL people. As this is our first instance in the Nordics, it will be a single-track single-day event, but we hope to grow it in the future. Our main target audience is in the Nordics, and we hope to see a lot of visitors not just from Sweden but also from our neighboring countries. Since this means the official language of the conference will be English, we will of course also welcome both visitors and speakers from the rest of Europe and the world as well! If your company is interested in sponsoring the event, please let us know at sponsors@nordicpgday.org, and we'll be sure to send you our sponsorship information as soon as it's available! For the rest of you, keep up with our website or follow us on Twitter for updates! See you in Stockholm in March next year!